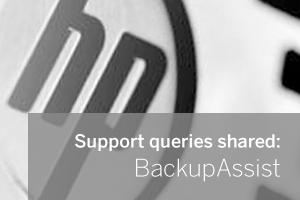 We have seen two instances recently where BackupAssist has been used to run an image job on HP Proliant servers but the job fails 98% through the image of the C: drive with the error ‘Drive Cannot Find the Sector Requested’. This would usually point to physical drive sector issues and a possible dying disk, but after some further investigation it would appear that this is actually a specific issue to do with the pre-installed status of System partitions on HP Proliant range of Server platforms. Running a chkdsk command shows no errors to fix. So far we have identified the same issue on both HP ProLiant ML350p Gen8 and HP ProLiant DL380p Gen8 hardware however it is likely to effect other similar Gen8 servers. The actual problem appears to be related specifically to servers that have been installed with HP Intelligent provisioning and as such the drive structure is effected. The fix turned out to be quite simple. You Shrink/Resize the C Partition volume by at least 500MB ,some users have tried 1GB.